Master Marine, Bayou la Batre, Ala., has delivered the mv. Tom Torretti to Waterfront Services Company, Cairo, Ill. The 67- by 28-foot fleet boat is powered by a pair of Mitsubishi S6R2-Y3MPTAW Tier III diesel engines, producing 803 hp. each at 1,400 rpm. The engines, supplied by Laborde Products Inc., are coupled to Twin Disc MG 5321 gears at 5:1 reduction, turning 70- by 48- by 7-inch, four-blade, stainless steel propellers from Sound Propeller Services Inc. J&S Machine Works Inc. supplied the 7-inch ABS Grade 2 shafts, while Thordon Marine Industries Corporation supplied bearings, Thorplas bushings and shaft seals. Electrical power is provided by two Northern Lights M65C13.2S 65KW Tier III electronic controlled generators, also supplied by Laborde. The vessel has E300 electronic controls and RW Fernstrum Inc. keel coolers. Gulf Coast Air & Hydraulics Inc. provided the steering system and a pair of Quincy F325 reciprocating air compressors. 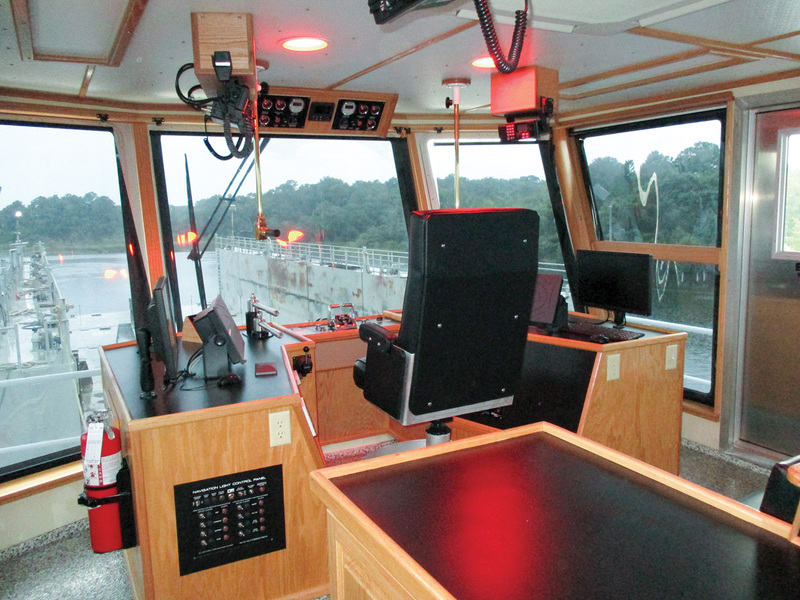 Schuyler Maritime LLC provided 11- by 18-inch rubber fendering around the entire perimeter of the towboat along with the push knees and fleet deck with MMI-installed weld caps between all fenders. Dickson Marine Supply provided a pair of Wintech 40-ton deck winches. R.S. Price & Son Inc. provided the Mitsubishi mini-split, heat pump HVAC system on all interior spaces, with Blakeney Marine providing all custom woodwork and interior finishes. Donovan Marine provided the large aluminum Diamond SeaGlaze windows, and Dales Welding & Fabricators LLC supplied the aluminum exterior doors. New World Inc. provided all of the electronics and communications for the vessel. The Tom Torretti has tankage for 10,400 gallons of fuel, 4,359 gallons of potable water and 9,500 gallons of ballast water. It has a maximum working draft of 7 feet, 9 inches. The Tom Torretti is the second of a series of four boats that Master Marine is building for Waterfront Services Company; the first was the mv. Miss Deborah, which was delivered in 2017. 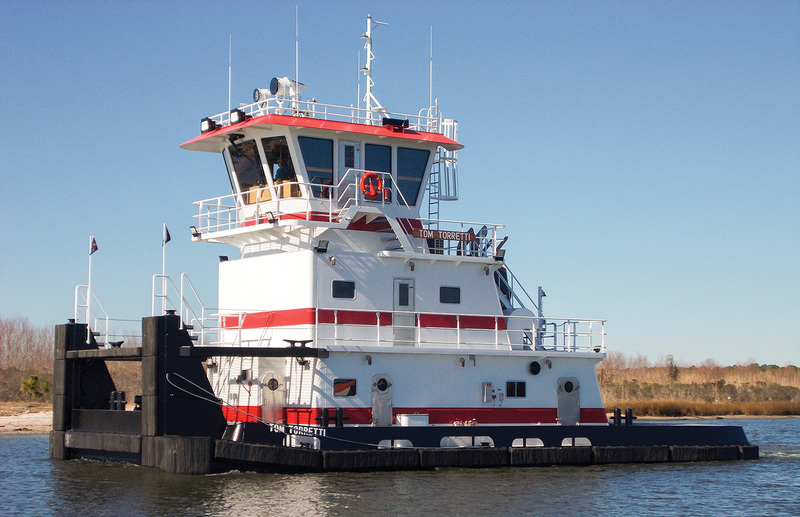 The vessel’s namesake is the director of bulk sales and logistics for Cooper Consolidated/CGB, Covington, La. 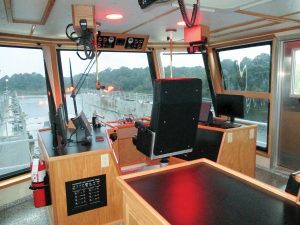 “Master Marine Inc. is very happy to be teaming up with Waterfront Services Company, providing them with their latest fleet boats with the best heavy-duty equipment available for these vessels while meeting Subchapter M requirements,” the shipyard said in an announcement.